Get your USAU up tp date. Ask you parents to come help at the tournament this weekend and text Richard if they can. Be at Nike Park no later than 7:30am Saturday! Get your USAU up to date. Go fill out the google doc on the blog with your info for white jersey and shorts, only fill in the info for items you are getting, if you only want shorts only list a size for shorts. Varisty and Parent, please be at the field no later than 7:30am on Saturday in order to set up and for players to warm up once set up is far enough along. As always Sunday will be dependent on Saturday. We need parents to volunteer you don't need to be there all day but we do need help throughout the day, even if you can only be present 1 of the days for a few hours please come help at the tournament and support the team. JV and Girls please come support the team, and help around the tournament if you are able to. All players need to be getting their USAU completed including the online waiver. Woodside will be having another Chick Fil A night this spring. Our night is Wednesday March 6, 2013 from 5pm to 8pm. 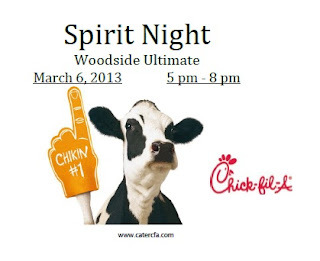 Please tell all your family, your friends at school, your teachers, people at church, the person in front of you in line at the grocery store, whoever, to go to Chick Fil A during those hours and mention Woodside Ultimate when ordering. We will get a percentage of the proceeds to help the team, if we are the highest grossing team for the month we get an even higher percentage. Last year over $700 was spent by people mentioning Woodside Ultimate, lets get it even higher this year. Everyone needs to be getting their USAU Dues up to date, this is a priority! Varsity guys need to be up to date by Wednesday February 27, 2013. Girls need to be up to date by Wednesday March 6, 2013. JV needs to be up to date by Wednesday March 20, 2013. All players need to turn in their USAU Id to Coach Chappell once they get signed up. You can get the membership information and sign up on the USAU Membership Page. Make sure you do the online waiver when signing up. Please click this link for the Google Spreadsheet and fill in your information for White Jerseys and Shorts. Since we ordered Dark Jerseys in the Fall this will only be for Whites and Shorts, if you didn't get a Dark talk to the coaches there are a few extras for both guys and girls, extra darks will be $36. The price for whites and shorts will be $25 per item, so if you get just a white jersey or just shorts you will owe $25, if you get both you will owe $50. The sooner you fill out the form and pay the sooner we get these ordered and have them to wear. If you already have the white jersey or the shorts then you don't need to order them again. All varsity and Girls who we expect to go to Southerns need to have matching uniforms as required by USAU for the tournament, players on those teams make sure you have both the Full-Sublimated Dark and a White and Shorts. We have a few extra full sets of girls jerseys (old style dark and white) and shorts from years past, these can be had for $60. You would still need the Full-Sub Dark. We now have a first round bye for Saturday, this means we do not need to leave as early as originally planned. We will now be meeting at 5:45am at Woodside and leaving at 6am, be on time. We will be leaving for the Wolfpack Invite at 4:45am on Saturday morning, everyone needs to be at Woodside at 4:30am so that we can get on the road at 4:45am so we can get to the fields with time to warm up. The fields are Method Road Soccer Fields on the NC State Campus, they are on the corner of Method Rd. and Ligon St. I don't have an exact address beyond that, based on the map 800 Method Road should get you really close. We are staying at the Wingate by Wyndham - State Arena, 6115 Corporate Ridge Rd, 27607. The phone number is 1-919-809-8660. Schedule should be available on Wednesday so we will have a better idea of return time on Sunday. Early guess would be between 8-9pm. Players check the weather, its supposed to be cool, chance for some showers on Saturday and breezy on Sunday. Pack accordingly. Make sure you have all 3 forms needed - 1. NC State Waiver, 2. USAU Medical Authorization, 3. Woodside Permission Slip, if you haven't gotten them yet see Chappell. Triangle of Death - split into 2 groups, run short and long throws, run this on the second field where there is grass and you can cut a little better. Schedule: We discussed the schedule for the spring, you can see the complete schedule on the Ultimate Calendar. The big question marks right now are 1. will weather hold up to allow the local division of YULA Invite to occur which will allow JV to attend, 2. What date will Shore Tour occur and will they host a girls division again. 3. Who will host this years VA State Tournament - Woodside or LC Bird. Dues: We discussed Spring Dues, at this time we are working to overcome the loss of revenue caused by the rain reschedule of our fall college tournament. We also have to plan assuming we will be traveling to States since we do not know otherwise at this time. As such we are expecting to be much shorter on funds than we were last year. We laid out 2 scenarios during the meeting, the first where dues would be higher now ($60-Var/Girls, $50-JV) the second where dues would be lower now ($50-Var/Girls, $40-JV) but we might have to ask for a second fee at the end of the year. With a nearly unanimous vote the higher initial fee was approved. As discussed this does not cover the per player fee charged by USAU for Southerns, that will be dealt with if we receive a bid. If you need to split the payment into installments of $30 a couple times or $20 3 times that is fine and we are happy to work with you just have your child discuss with Coach Chappell or Coach Richard. USA Ultimate Dues: As always all players are required to be up to date members of USAU in order to play in VA State and in Varisty's case in order to play in the college tournaments. You can go to the USAU Website and signup/renew, you also need to complete the online waiver at that time. Varsity needs to complete this by Feb. 27, everyone else needs to complete it as soon as possible. Jerseys: We will be putting up a Google Spreadsheet shortly with jersey information. You will need to fill in your name, size, number in the document. We will set a date for when this must be completed by and will give an update of the cost as soon as we get the information from Spin. We will be reordering whites, and shorts, we did darks in the fall. If you already have a white with the vertical woodside logo or shorts then you won't need to order unless you want a new one. Please note players at Southerns are required to have matching uniforms! Practice/School: In reference to practice we asked everyone to please attend practice as much as possible, we as a team only improve as much as we practice together. We do understand that school comes first and if your child can't attend because they are getting class work in line that is totally understandable. We will be having players run for grades sometime in the coming week. Southerns: We have limited details for Southerns right now, just a date and location, we expect to hear on if we are accepted or not sometime in mid-late March. At that time we will have a meeting for the parents/players who will be attending and discuss details further. Middle School Ultimate: We have been in contact with the middle schools which feed Woodside, we would like to find a way to get Ultimate into their PE curriculum's. We have had some positive response and hope to arrange for us to bring a few of our Senior players to the middle schools to talk about Ultimate and give a short presentation. Hopefully we will have more details coming soon. Player Contact Info: We are asking all players to send Coach Chappell a text with their name so he can rebuild his phone database. Please send him a text at 757-952-7067. Any parents who would like to do the same thing so you can be in touch if needed feel free to do so.